As of 1st March 2017 the new regulations will mean manufacturers will no longer be able to make booster seats for smaller children, only the backless boosters for kids over 125cm tall. This however only applies to new purchases of car seats and booster seats and if you are already using a backless booster you are able to continue to use this. However it has been proven time and time again just how much safer a highback booster can be for your child and for us its really not worth the risk. As a mum of 2 I am fully aware just how expensive car seats are and so today I wanted to show you a car seat that complies with all the new regulations and is really reasonably priced too! Here is the new car seat from Diono the HIP highback booster seat suitable for children aged 4-12 years with a weight range of 15-36kg and up to 160cm in height (classed as a Group 2/3 car seat). We love this seat and James and remarked on just how much comfier it is compared to his last high back booster, which no doubt is down to the extra padding in the HIP seat. The new HIP highback booster from Diono incorporates full body side impact protection and reinforced head support with 6 height positions that can be easily adjusted with one hand making the seat so safe meaning you can drive safe in the knowledge your little ones are suitably protected. The deep side wings and double wall head support make the HIP highback not only really comfortable but durable, strong and safe too. One of the first things I noticed about the HIP was how lightweight it was, a big bonus if you will be using the seat between more than one car or need to travel with it. But just because the seat is light weight doesn't meant style has been compromised. The seat looks stylish with a black colour scheme with grey feautres including not 1 but 2 handy cup/snack holders on either side of the seat. 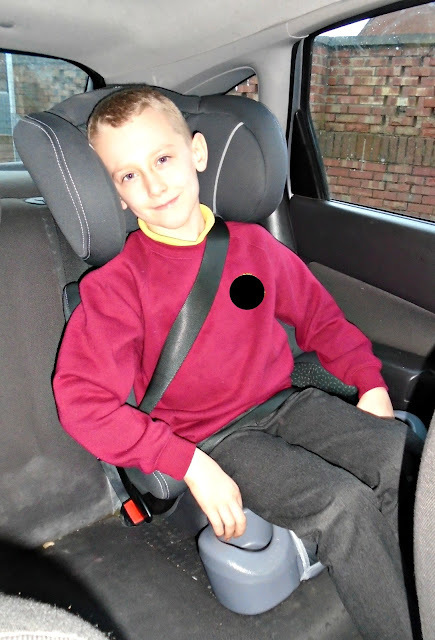 The headrest on the HIP is also adjustable with 6 positions meaning safety and comfort whatever your child's height! If there was one little thing I had to pick out about this seat it would be that the seat cover seems to have started bobbling quite quickly. James has been using the seat for just over a week for the school runs and general wear and some areas of the fabric have begun bobbling. This of course does not effect the use of the car seat and is purely a cosmetic observation. The covers on the HIP high back booster are completely removable which anyone with kids will know is super important! The covers are easy to remove and reapply making it a really quick and easy job. 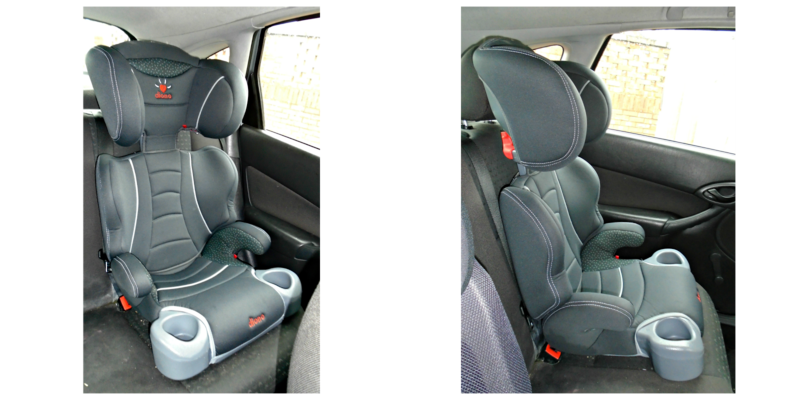 The Diono HIP Highback booster seat is priced at £40 which in my opinion is a fantastic price and if you are currently using a backless booster or are just about to move up to this size/group car seat it really is worth a look. If you want to take a closer look at this seat check out the Diono website.